Gensler has designed and developed a new office environment for their own Orange County office located in Newport Beach, California. Gensler celebrated its 30th anniversary in Orange County with a new creative work environment in Newport Beach. With a residential feel, the office is an extension of where people live while providing a variety of work settings for people to enjoy. Centered on the firm’s extensive workplace research, Gensler’s Newport Beach office incorporates all four work modes – focus, collaboration, learning and socialization – to create an energetic, next generation office space. The integration of a variety of work settings, including a design innovation lab, circular resource library, a public gallery and café, and informal meeting spaces, fosters creativity within an agile work environment, drawing upon an abundance of natural daylight. Accelerated connectivity, creativity and productivity were outcomes of the highly collaborative design strategy. As a result, private office space was reduced by 50 percent and social, learning and focused workspaces were introduced to foster collaboration and inspiration among designers. The 1st and 2nd floor of 4675 MacArthur Court spatially celebrates a ground floor entry to Gensler Newport Beach, directly aligned with the building’s fountain motor court, a dramatic interconnecting stair and a newly created loft space. The design philosophy fuses elements of “the modern beach house” and the outdoors, connecting the space to the surrounding Newport Beach community. With a commitment to sustainability, the project features significant energy and waters savings. Lighting power is reduced by over 20%, and water use is reduced by over 40%. Low emitting materials were used consistently throughout the project, including adhesives and sealants, paints and coatings, flooring systems, composite woods, and systems furniture and seating. 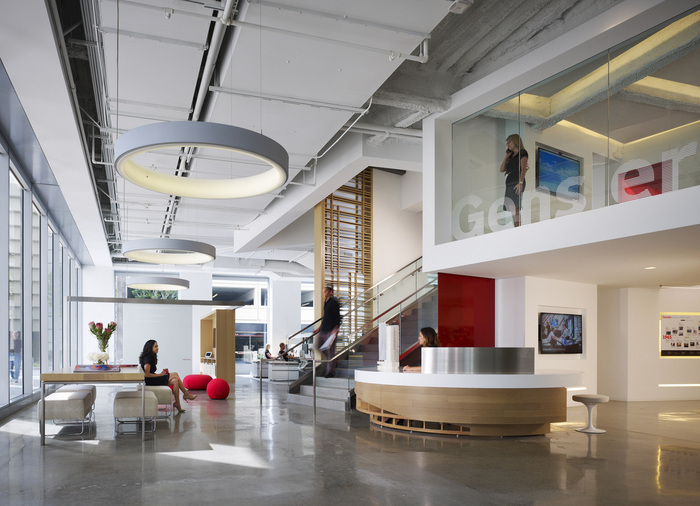 Gensler Newport Beach is pursuing LEED Platinum certification.